One of the most important aspects of the sport of hockey is strategy. The offensive and defensive players must unite to score goals and keep the others from doing the same. Hockey strategies and plays vary from the simple, standard formations to complicated one-of-a-kind maneuvers that are sure to keep the other team guessing. Make sure that all players learn and master a variety of hockey strategies and plays so that the opposing team isn’t able to anticipate all their moves within the first period. 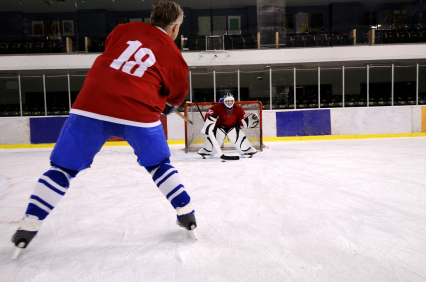 These particular hockey strategies and plays are for the defensive lines. Here’s a defensive strategy called “One Player Forecheck” that is most often used to protect a lead later on in the game, or when one team is superior to another in talent and skill. In hockey, forechecking occurs when a player from the defensive line follows and puts pressure on a particular opponent while in the defensive zone. For the “One Player Forecheck” play, the center covers the center ice area of the rink, which forces their opponents to stick to the boards to break into the zone. The wings each cover their respective sides while the defensive players guard the blue line, covering their half of the zone. After the offense crosses the line that the defenders are defending, they each take one player and follow them, forechecking to the best of their ability. The most important thing to keep in mind when running this play is that the defensive players should always remain in motion at the line they are guarding. This allows them to match the speed of their opponent’s offensive burst into the zone. Additionally, the defensive players should try to remember to keep their sticks on the ice to up their chances of retrieving any errant passes as the offense skates through the neutral zone. To run this play more conservatively, the defense players can guard from the red line instead of the blue line. Here’s another defensive strategy called the “Zone Defense”. The Zone Defense is the most basic defensive strategy in hockey, but that doesn’t mean it can’t be an effective way to protect the zone. For the Zone Defense, each player covers a particular area or zone of the ice. The defense players are each responsible for the zone from the dot in the middle of the faceoff circle to the corner and back out in front of the net. The wings each take the area from the faceoff dot to the blue line while the center covers the middle area. When an opponent enters one of the defensive zones, the defender in charge of that zone has the responsibility of guarding the puck carrier and trying to prevent them from passing or taking a shot. Players are allowed to leave their zone if two or more attackers pass into one of their teammate’s zones. The key to running the Zone Defense successfully is being able to skate and stickhandle quickly so that defenders can intercept passes, leading to a quick turn around. When employing the zone defense, always be careful to make sure that attackers don’t slip through the areas between the zones, especially in front of the net.